Robert A. Chrencik, University of Maryland Medical System president and chief executive, has been placed on temporary leave amid the contracting irregularities that have rocked both UMMS and the Maryland political class since they was first disclosed last week. 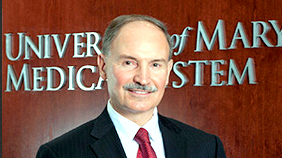 Chrencik, as The Brew reported on Tuesday, has been a driving force behind the privatization and expansion of the hospital network since he took over as CEO in 2008. Now his management style is being scrutinized in the wake of the disclosure that members of the UMMS board – including Mayor Catherine Pugh – have prospered from lucrative business deals with UMMS hospitals. Today’s announcement was made in a statement by UMMS Board Chair Stephen A. Burch. Chrencik’s leave of absence begins next Monday, March 25. John Ashworth, Senior Vice President of Network Development for UMMS and Associate Dean at the University of Maryland School of Medicine, will act as interim President and CEO. Burch, a retired telecommunications manager and ex-Verizon executive, was centrally involved in Pugh’s 2016 campaign for mayor. He made a $50,000 last-minute loan to her campaign committee shortly before the Democratic primary where Pugh narrowly defeated former Baltimore mayor Sheila Dixon. Burch has continued to make large personal contributions to Pugh’s finance committee since 2016. Chrencik likes to talk about what he found at the University of Maryland Medical Center when he came there in the 1970s – a frequently money losing public hospital that “didn’t have that private enterprise feel.” as he put it in a 2017 Citybizlist interview. Since then, removed from the public university system, reconfigured as a 501(c)(3) corporation, UMMS has become a hospital network on steroids, its domain including 14 hospitals,28,000 employees and $4.4 billion in annual revenues. And presiding over this network and taking home one of the region’s highest salaries ($4.27 million in 2016) was, until today’s announcement, Bob Chrencik.